A crucial verdict at the end of a trial. Wedding vows that cement a long courtship. A baby's first breath after seven hours of labor. I can't put the massive scope of this occurrence into words. I can only show it to you. Lake Mead is the largest reservoir in America. 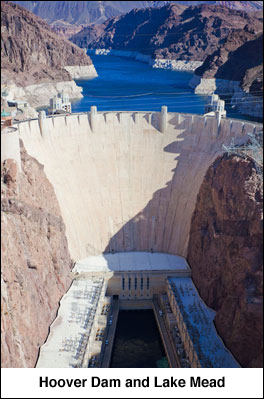 When full, it holds 9.3 trillion gallons of water behind the colossal Hoover Dam. Now, I want you to imagine that a tiny crack in the dam's face begins to leak. First, it's just a single drop of water. A minute later, two drops escape. The next minute, four more drops leak from the crack – and so on. How long do you think it would take to consume Lake Mead entirely? When I ask this question at conferences, audience members usually answer "a month." Some of the sharper ones will guess as little as a week. It would drain the lake dry in just 57 minutes. And turn the 110-mile-long reservoir into a fish-littered mud flat. Believe it or not, that's when almost 97% of the depletion takes place! You wouldn't have a clue about it at the 52-minute mark. That's because only about 3% of the water would have leaked out at that point. Yet just 5 minutes later, you'd be floundering in the bottom of the lakebed! It's also at the heart of how a lucky, informed few could get outrageously rich from it. I know BOTH of these things because I've spent the last 30 years studying the way people use the resources and materials that build our world. Are being depleted at an exponential rate, like the water in my Lake Mead illustration. Which is why almost 97% of it disappears in the last five minutes. As you can see, we're about where the "elbow" begins on the depletion line. Soon, this demand will be going nearly vertical. You've already felt this beginning. It's in the uptick of prices on pipe, wire, solder, and fertilizer at the home center. 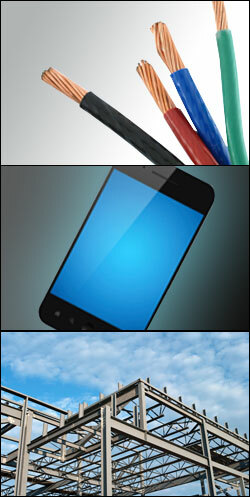 Batteries… Touch-screen electronics… Certain parts for your car or truck. And quite a few items at the grocery store. It doesn't seem too dramatic right now. The way people live, work, build, eat, travel – and especially invest. It also has the potential to make a well-positioned few richer than they've ever imagined possible. I'm going to prove that a succession of historic profit opportunities awaits those who know how to leverage this predicament. Or even two or three times this much over the medium term. I assure you, this is no pipe dream. Potentially HUGE money could be made just as fast as resources can become scarce and expensive. Think of the exponential depletion example I showed you – but in reverse. In just 27 days of this, you'd have over $1.3 million. That's the power of the exponential growth I'm talking about – the Five-Minute Effect we're beginning to feel in resources right now. If you know your history, these kinds of returns shouldn't come as a surprise. Gold, silver, salt, whale oil, ivory, spices, diamonds, crude, timber – even bat guano. All of these things, and more, have made a few well-positioned people extremely rich. And the cycle's about to begin again, starting right now. Virtually every substance vital to modern life will soon be enormously expensive. And enormously profitable for investors who know how to play it. There's going to be HUGE MONEY made in all of these things – and a lot more. And it's going to start happening right now. Most of the $700 average cost of a converter is in the platinum (or palladium) it uses to turn your car's exhaust into less harmful emissions. But imagine what a catalytic converter will cost in 8 years – when global platinum supply deficits are estimated to be 7.5 times higher than they are today. It's said that they used to find 60-pound copper nuggets sitting on the ground near the site of Utah's renowned Bingham Canyon mine. But to get this much copper from the mine today, they have to blast, crush, and process 4½ tons of ore rock – from a pit 4,000 feet deep! It also used to be relatively simple to dig solid silver out of the world's better veins. Now, mining firms are offering $10 million rewards for new technologies that can unlock trace amounts of silver from giant silica deposits. That some miners have resorted to leaching it out a molecule at a time – using specialized bacteria! Governments of the developed nations around the world understand this Five-Minute Effect, too. That's why they're moving pieces around the board to try and lock up resources. Aside from petroleum, these are thought to contain significant quantities of gold, platinum, manganese, lead, tin, and more. China's getting in on the game, too – staking a forcible (and increasingly disputed) claim to the South China Sea's reserves of oil, gas and other valuable minerals. The search for resources isn't limited to planet Earth, either. Even the U.S. has an asteroid exploration mission scheduled to launch in 2016. They're unmistakable signs of the Five-Minute Effect I'm talking about. Now, I can't make you immune from the effects of this crisis. No one can do that. Starting with two specific recommendations that have the potential to skyrocket – beginning immediately. The FOUR factors creating this impending world mineral supply crunch. Precisely how this predicament could impact your life – and your wealth. A simple way to capitalize on every lucrative opportunity this Five-Minute Scenario generates. But I caution you: This report won't be at your disposal for very long. And how you could play it for extreme wealth. Hello, my name's Peter Krauth. I've spent 30 years of my life as an analyst and veteran of the resource and mining sectors. If there's a tangible asset of any type that's bought and sold, I track it on a daily basis. It's how I know things about the world resource picture that others don't. Knowing all of these things tells me with complete certainty that the Five-Minute Effect of global palladium has already begun. In fact, palladium mine supplies have declined as much as 15% in five years. 2010 marked the very first year that world palladium supplies did not meet demand. 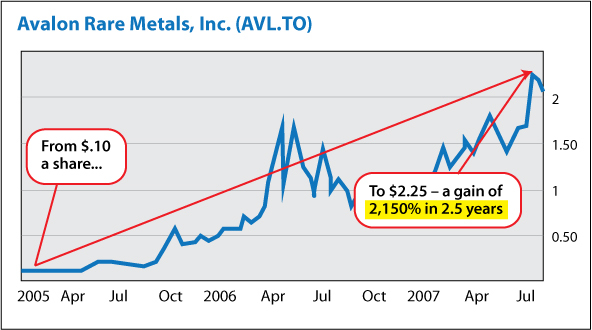 In 2011, platinum supplies went in the red, too. And the global platinum deficit is expected to multiply by as much as 752% over the next 8 years. These are the reasons why my recent recommendation on platinum is already up as much as 41% in a little over two months! And I'm going to show you what those reasons are – before the Five-Minute Effect potentially takes this company up another 2,000%. It's no stretch at all to envision 20-times-your-money returns for this company in the "five-minute" ride it's poised to take. And it's not just platinum and palladium. The Five-Minute Effect is about to take them all through the roof. It's an arena in which I've been showing my readers big gains for years. Of course, that's doesn't include the slew of double-digit winners – or the call options plays closed for gains as high as 123%! But you've got to like your odds: Fully 86% of my service's current open resource picks are winners right now. 24 winners out of 28 picks, showing gains as high as 183% – and counting. I would still strongly recommend 22 of these plays right now. In my opinion, they will continue to push even higher as the Five-Minute Effect kicks in. I'm also going to offer you a pair of urgent trades I believe could make you two or three times this much! in the "last five minutes"
You've seen the news: There are now seven billion people on Earth. You may also already know that we're expected to add another billion people in just the next 15 years. A shift toward radically greater per-capita consumption. 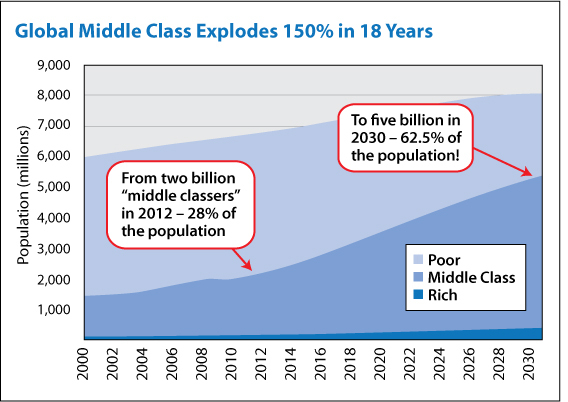 According to the latest data, the bulk of the world's population will be transformed from "poor" to "middle class" in just the next 18 years. Almost all of this growth will happen in the 141 nations listed by the IMF as "developing" or "emerging." The GDP growth rate of these countries is expected to double that of developed nations within eight short years. And this list does not even include "newly industrialized" giants China, Brazil, India, South Africa, Malaysia, Mexico, and Turkey! What does this have to do with the Five-Minute Effect? Because the "developing" stage is the period when nations consume the most resources. Take copper, as just one example. Than has been mined so far in human history! Provided you know the best-positioned copper-focused companies to trade. And it's not just the copper situation that's getting desperate. It's just about every mineral you can think of. Is expected to soon exceed global production by 40,000 metric tons per year. According to Robert Vance of the Nuclear Energy Agency, Global uranium production reached its historic peak in 1980. And by 2020, only ONE of the ten largest uranium mines on Earth is still expected to be producing. The world's silver mines haven't exceeded demand in a decade or more. New mineral discoveries aren't going to save us, either. At least not on this planet. And there have been only 10 "major" finds over that same period. Contrast that to the 15-year period, from 1980 through 1994. During that time, there were 25 "world class" and 95 "major" mineral strikes. 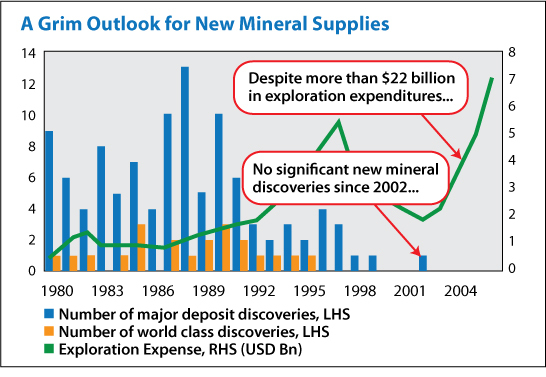 Now, to be clear: Not all mineral elements are facing shortfalls in global reserves. In fact, you may see estimates to the contrary. "When measured in parts per million, many of today's most vital minerals aren't particularly scarce in the Earth's crust." Sure, that may be true – from a purely scientific standpoint. Is that the Earth's crust is 20 miles thick! Over the last 160 years, humanity has dug up, refined, processed, and consumed all the easy-to-get minerals. From bigger and bigger quantities of rock. NONE of them are getting more plentiful. Either in terms of new discoveries, or in terms of their concentrations within known deposits. Don't get me wrong. They do still exist – and we can get at them. That's where a few individuals will have the opportunity to become extremely rich. On anything. Anywhere. At any time. The Bingham Canyon mine I mentioned earlier. Which they haul up from a pit in the ground ¾ of a mile deep – and 2½ miles across! A century ago, it wasn't unusual to find nuggets of 100 pounds or more in many copper-rich zones of the U.S.
Now, I walked you through all of this for one reason only: So that you can see the staggering amount of energy it takes to accomplish all this. The Bingham Canyon Mine's smelter and refinery alone use over 600,000 BOE (Barrels of Oil Equivalent) worth of energy every year. Or the ocean of fuel the mine's fleet of 70 jumbo dump trucks, nine massive shovels, and 180 utility vehicles consumes. These things are estimated to put the Bingham Canyon mine closer to a million BOE per year in energy consumed. If not more. That's roughly $100 million worth of energy at today's prices. The money it'll take to bring that copper to market will multiply exponentially. 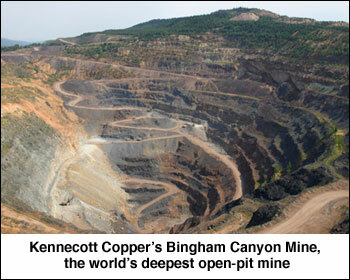 No, it's not Kennecott, the owner of the Bingham Canyon mine. The firm I'm going to tell you about has a profit potential many times greater than what that copper giant could offer you, in my opinion. I'm talking about the potential for gains of 30 - 40 times your money. Or MORE. Compounding extraction costs multiply resource prices exponentially. In the oil business, they call it EROI (Energy Return On Investment). That refers to the amount of energy it takes to extract more energy. In the petroleum world, that ratio has been getting worse for decades. We could bring 100 barrels of oil to the surface with the energy equivalent of a single barrel! Now, the decline of conventional fields – and our increasing reliance on deep-water and unconventional sources – has taken that ratio closer to an estimated 11 to 1! Just like oil, the accessibility of in-ground mineral reserves is utterly dependent on cheap fossil fuels. And I don't have to show you the mountains of evidence proving just how quickly the era of cheap oil is coming to a close. Instead, it could be a time of incredible opportunity and profit in the real world of supply and demand. It may be the closest thing to a "sure thing" you'll ever see in your financial life. Now, if you're like me, you're skeptical of anything that's called a sure thing. Anything involving the markets entails some degree of risk. That I'm not really going out on a limb by predicting the Five-Minute Effect is as close to a sure thing as gravity. There's another factor that's contributing to the Five-Minute Effect. It's something few analysts are talking about. Global mineral stockpiles are at an all-time low right now. Resource companies have been hit by the same downsizing as everyone else. The first things to get cut are budgets for minerals exploration. And for the development of existing finds. When the going gets tough, these companies all but shutter their operations. For revenue, they sell off their stockpiles. Leaving virtually no mineral reserves left to satisfy demand. It's going to take at least 2 to 3 years for mining companies to ramp up production to meet this pent-up demand. If they can catch up at all. There's literally no possible scenario EXCEPT soaring minerals prices. And soaring gains for those who are positioned in the right companies. How high could those profits go? Developing world growth has driven minerals gains over the last ten years. And China has led the way in consumption by far. Molybdenum is a crucial additive in structural and high-strength steels. More than 44% of which is now made in China. Thompson Creek's a diversified player in multiple minerals projects, including copper, gold, silver, lead, and zinc. This combination paid off big for minerals-focused investors. To the tune of nearly 40 times their money in under two years! Notice how all these gains moved in lock step with the period of greatest global growth prior to the meltdown of 2008/09. They leave little doubt that the stuff you can stub your toe on is the place to be for huge returns. I know this firsthand. I was advising private investors on how to bank gains in the resources sector throughout the early and mid-2000s. I was watching as firms like Avalon, General Moly, Thompson Creek and others soared to the moon on Chinese demand. Imagine how vertical the commodities market could go as 141 emerging nations balloon the world's middle class by 150%! That's the Five-Minute Effect I've been talking about. And the HUGE profit potential during this period is why I'm launching a brand-new research service. It's called Real Asset Returns. So how did I do this – especially last year, when so many resource investors got crushed? Most of which can be disastrously misleading for investors and analysts who don't know what they're doing. These criteria and others are how I select the recommendations my readers see. But the impressive gains I've shown you so far are nothing compared to what my new Real Asset Returns service is aiming for. I'm talking about returns that potentially double or triple the 1,344% to 3,977% killers I showed you earlier. And focusing on the biggest, hottest scarcity plays in a world that's ramping back up for feverish growth. If it's a tangible commodity, Real Asset Returns will be looking at the plays that could show you the biggest possible gains. Isn't that what you really want in this uncertain, volatile market – to make your fortune in something real? Something backed up by hard assets with honest value in the world? Something that can appreciate in value while inflation and crushing debt are sending everything else into the tank? Something that's not tied to the amount of interest some mega-bank is charging to millions of cash-strapped consumers? Something completely detached from the shady credit default swaps and mortgage-backed securities that killed off the global economy four years ago? Something that's not going to disappear in some "flash crash" that erases derivative-based fortunes in a nanosecond? That's exactly what Real Asset Returns is all about. 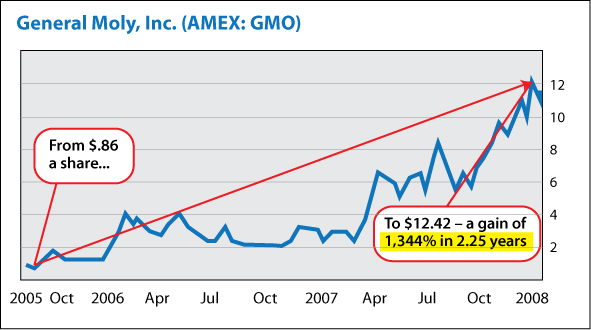 Like I said: The greatest money made by investors for years to come will be in the stuff of life. If you agree, then I urge you to sign up for RARE right now. This new service is backed by my satisfaction guarantee. According to the U.N. Food and Agriculture Organization, global food production will need to rise by a whopping 70% as the world population swells. Yet arable land is getting scarcer by the day. The production of U.S. farmland is already at its limit. And in the last two decades, 41 million acres of farmland have been converted into condos, strip malls, and offices. Today, only 10% of the earth's land is suitable for farming. And the price of land is soaring. In the last year alone, Iowa farmland prices skyrocketed by 30%... and by 25% in Illinois and Indiana. And that doesn't even account for this year's drought – the largest in 50 years. In fact, only the "Dust Bowls" of the 1930s and 1950s destroyed more farmland. More than half of U.S. counties have been designated disaster zones, thanks to the devastation in the Corn Belt. So it's no wonder that over the past twelve years, we've seen agricultural prices skyrocket, with wheat up 172%, beef up 118%, corn up 221%, and sugar up 302%. Walmart CEO Bill Simon recently said: "U.S. consumers face serious inflation in the months ahead for clothing, food, and other products." And that brings me to the first of my "5-Minute" recommendations – a company that's going the extra mile to solve the problem of global food production. It's the only viable solution, and one that's not only embraced by food producers, but demanded throughout the entire globe. In fact, this company provides the material to increase crop yields by 50% to 100%. This company's fertilizers create the most efficient and cost-effective way to produce more food. It's that simple. The major nutrients in fertilizer are nitrogen, phosphorus and potassium. These life-giving elements replenish soils in harvest and add nutritional value to food. According to the International Fertilizer Development Center: "No country has been able to expand agricultural growth rates and eliminate hunger without increasing fertilizer use." And the company I'm talking about produces all of the "big three" nutrients. It's a true multinational, with operations in seven countries, playing a vital role in world food production. What makes it so critical to get into this now, is that this company has in-ground reserves big enough to supply the world for 100 years. It's the biggest, best game in town. In fact, the company I'm talking about is capable of producing 1.6 million tonnes of potash a year, mainly from conventional underground mines. Its various potash products are used in fertilizers, while industrial grade potash goes into the manufacture of industrial products from food to soaps. The company also produces over 7 million tonnes of phosphate products a year, which are used as liquid and solid fertilizers and animal feed supplements, food and beverage products, and in metal compounds. And thirdly, its nitrogen products are used in solid and liquid fertilizers for agriculture, as well as in the manufacture of "downstream" industrial products. This company is a powerhouse ready to explode with profits. And it's cheap, selling for a P/E of 15 – and to top it off, it also pays a dividend. In fact, it doubled its dividend in 2011, then doubling it again in 2012. The market value of investments it holds in Middle Eastern, Chilean, and Chinese public fertilizer concerns is roughly $8.6 billion. And the future of this company and its stock prices looks beyond incredible. Latin America is seeing robust demand led by Brazil, which saw record shipments in Q2. In North America record droughts mean this area is poised for a major rebound in the second half of 2012. China's also been experiencing serious food supply pressures. Yet China understands the need to balance the three fertilizer nutrients - nitrogen, phosphorus, and potassium – and will also likely build on recent shipment volumes. With all this going on, it's like a literal oasis in the desert for wealth builders, even with a potential share buyback anticipated, as management seeks ways to increasingly reward shareholders with growing profits. The rationale is simple: No matter what, we are going to keep eating. The demand on our agricultural output will be more strained than ever, as we search for ways to increase crop yield. Fertilizers are the simplest and fastest way to boost food production. Into a special, FREE Urgent Trading Action Alert – which you could have in your hands immediately. I'm going to show you how to get that, with no obligation, in a moment. Did you know that there's over a mile of copper wire in every car built? You'll know it soon by the metal's price. And there's copper in everything important to their lives. The pipes that carry their water, the wiring in their cars, homes, offices, schools, hospitals, and more. Whenever growth is in the picture, copper's hot. The outlook for copper is doubly hot in these "last five minutes" of cheap resources. But the BEST way I know of to play it right now is this American firm. They've got under-the-radar stranglehold on some the world's largest copper deposits. They've also corned impressive quantities of zinc, moly, and lead into the bargain. Companies with the biggest in-ground reserves will fare the best. Especially from a profit-margin standpoint. And this company produces copper at less than 10% of today's market price! That leaves 90% in profits for acquisitions, development of new resource deals, equipment and infrastructure. Not to mention handsome dividends to shareholders. That's right: They've more than tripled in value DURING the worst domestic and global financial malaise of our lifetimes. But this is a drop in the bucket compared to what this company's in position to do. This one has the potential to go the farthest. 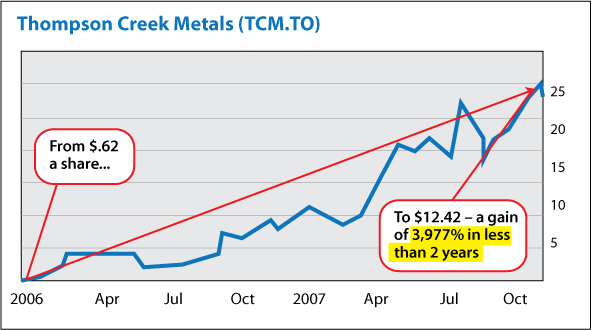 In my opinion, it could beat the 3,977% gains Thompson Creek pulled down for investors in 2005 to 2007. But you must get in now if you want a shot at this caliber of returns. These metals-focused stocks can move lightning fast, as I've already shown you. Which you can get immediately. All you need to do is accept a trial subscription to Real Asset Returns and get started right away. Do it now. There's little time to waste. Weekly Trading Updates – My regular e-mail reports will keep you in front of relevant resource trends, and my specific, urgent plays on them. You'll receive these as soon as I pinpoint them from my tracking and analysis. Urgent Trading Action Alerts – As markets suddenly shift, so will our plan of attack for maximum profits. With these urgent, unscheduled e-Alerts, I'll recommend actions to take, prices to aim for, and entry- and exit-point advice. Monthly Overview Dispatches – Every month, you'll get a full-length e-mail from me. In it, you'll find detailed updates on your RARE recommendations. You'll also get my quarterly in-depth profiles of featured commodity plays. Subscriber-only Conference Calls – Periodically, I'll convene a conference call with an upper-level commodities-industry player. In these, you and other RARE subscribers can get the inside line on the "now" of resource investing. 24/7 Access to the RARE Web Resource – Your unique password is the key to accessing the service's model portfolio. You'll also get access to every dispatch, alert, recommendation, Special Investment Report and more. That's what Money Map Press normally charged for a year's worth of my former research service, Global Resource Alert. And they don't have trouble filling subscriptions at that rate. research service for 70% OFF! I've asked Money Map Press to suspend the everyday price of $2,900 per year. Instead, I've asked them to grant a special introductory subscription rate to those who take me up on my offer today. That rate: Just $895 per year. But I should warn you – this low introductory rate will likely only be available for a short time. And you have my written guarantee of satisfaction. Simply let us know for a full refund of your subscription price. See? You can sign up in confidence, risking nothing for a full 90 days. Scour every new pick I recommend for those three full months – "paper trade" them if you like, just to see for yourself. You'll also have the chance to pounce on the two urgent picks you're going to receive immediately. If you're not fully satisfied with the kind of gains you could be seeing in the first 90 days, just let us know… and you'll receive a full refund. Where can you get something like that these days? Much less the one-of-a-kind resource trading recommendations I'm going to reveal in Real Asset Returns. And $895 a year for intensive guidance from the commodities trenches? That's unheard-of, too. That won't buy you a year's worth of decent cable TV! I'll refund every penny of your subscription price. All you need to do is let us know. The only way I can do this is because I'm so confident you'll do so much better than that. I can see exactly where the compounding demand is going to come from. I can see huge impending supply imbalances, some of which have already begun. I CAN guarantee that no matter what happens in the commodities world, I'll be there to help make sure you've got a shot at the biggest gains from it. All you need to do is sign up for a trial subscription to my new Real Asset Returns commodities trading research service. I've proven beyond doubt that the Five-Minute Effect is starting NOW. I've offered you my two most urgent plays FREE – they could be in your hands immediately. And I've rolled back the subscription price to a fraction of what it's worth: Just $895 per year. There's nothing more I can do to make it easy for you to try Real Asset Returns. Demand is too great. Reserves are too small. And the costs of extraction are mounting exponentially. This crunch will profoundly change the way we live, work, spend, and travel. Will be made in shrewd plays on this Five-Minute Effect. Not just on the supply and demand of resource shortages. But in the solutions to these shortfalls, too. To put you in these lucrative opportunities before everyone else piles in. Or even sees them. We could soon see movement in key plays that could double your money practically overnight. But if you're not set up to take advantage, you'll miss out on the biggest gains. You've got only one chance to make sure you're in position: Right here, right now. And the one tool you absolutely can't do it without is Real Asset Returns. Nor will the low introductory price of $895 per year. Click here to sign up – while you still can. Or call 855.509.6600 (410.622.3004 for international calls) during business hours and mention priority code WPPRN601 to begin your subscription immediately. You won't regret it. I literally guarantee that. P.S. I can't say how long Money Map Press is going to let me offer you my red-hot, newly expanded commodities research for a ridiculous 69% OFF. No pun intended, it could literally be five more minutes. I don't know – but I'm SURE it won't be very long. So if you want in, now is your chance. You'll be kicking yourself if you miss out and have to pay full price later.